Hello! I had a chance to play with this week's Viva la Verve sketch! This is my card for the week 2 challenge (all details here in the Verve Splitcoast forum). This is going to be either Dan's Valentine's Day or anniversary card (both are coming up next month).. The funny thing is that he walked in and out of my craft room several times while I was making it and never gave it a second look! I went all out embellishing this card since I know that I won't have to mail it.. LOL! 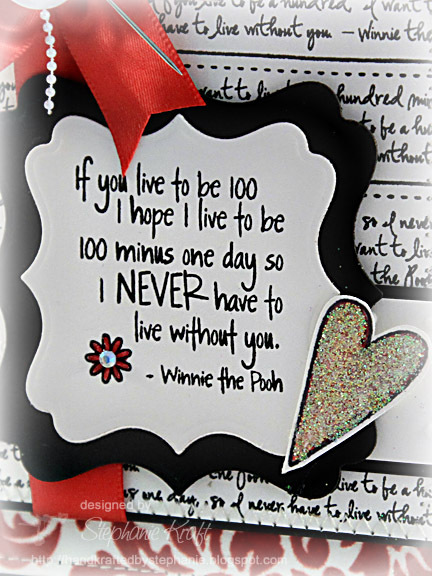 My main image panel is a Winnie the Pooh quote that is from Verve's Beautiful You set. 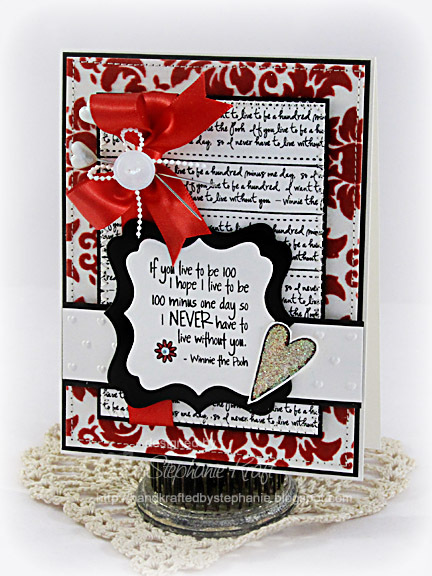 I love this set as it is full of quotes and each one was chosen by one of the Verve Divas (if I remember correctly, this one was contributed by Amber). I created my own patterned paper by stamping the text from Verve's Text Objects (the text repeats the same Winnie the Pooh quote). I matted the smaller rectangle on top of some yummy My Mind's Eye flocked paper. Accessories: Labels Sixteen Nestabilities (Spellbinders), Hearts embossing folder (Provo Craft), Markers, Spica glitter pen (Copic), Trinket pins (Maya Road), Starfire glitter (Taylored Expressions), Rhinestone (Pizzazz Aplenty), Satin ribbon, Pearl trim, Button, Foam tape, Thread, Sewing machine. Such a gorgeous card! I know he will love it! Everything about this is just wonderful. I so love the Pooh sentiment - he'll love it!! Gorgeous!! I love the reds and blacks! Very stunning!! Awwe I love the sentiment Stephanie.. the heart pins with the string of white pearls is so pretty!! Beautiful LOVE card Stephanie! I am sure Dan will treasure it whether he receives it for Valentine's Day or your Anniversary! Beautiful quote and lovely design!